What to do with leftover lamb? This crispy lamb salad brings a lovely new reunion/resurgence of your yesterday meat. Use a stick blender or food processor to blend red onion, sage, oregano, mint, rosemary, lemon zest and garlic. Blend until reaching a smooth puree consistency. Place in a medium sized mixing bowl. Add the turmeric and pepper and mix in with a spoon. Put to one side. On a clean chopping board slice or shred the leftover lamb into small shredded pieces or strips. 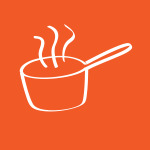 Place a large frying pan onto the stovetop at a medium to high heat. Heat olive oil in the pan until hot (not smoking) then place the marinated meat gently into the hot oil (It may splash – have a splash guard ready). Fry until the meat is crunchy and golden to well done. Turn off once cooked and let cool for 5 mins before placing on the salad. As the meat is cooking you are preparing the salad; wash all salad ingredients and slice into salad size pieces. Layer in a flat bowl with the lettuce in the bottom and other ingredients on top creating a beautiful and colourful dish. Once you have finished making the salad gently place the lamb on top in the middle. Squeeze juice from one lemon or lime over the top of the lamb. Finish off with fresh coriander (or parsley) and spring onion as garnish. Lovely served with olive oil and wedges of lemon on the side for people to dress the salad themselves. You could also add some toasted seeds as a garnish.